The average, everyday medieval person did not need fancy clothing. They needed something that was above all else, functional. They needed a garment like the Peasant Shirt, which features effective, simple construction without any frivolous decoration. This garment is made from 100% natural woven cotton. It is considered a medium-weight garment that strikes a healthy balance between weight and protection. The shirt features a small collar and a deep neckline that is secured with three fasteners. It can be closed or left open to suit personal taste. The full-length sleeves are loose-fitting on the arm and end in fitted cuffs. The Peasant Shirt comes in a variety of attractive colors. The shirt is also pictured above with a leather belt, which is not included. 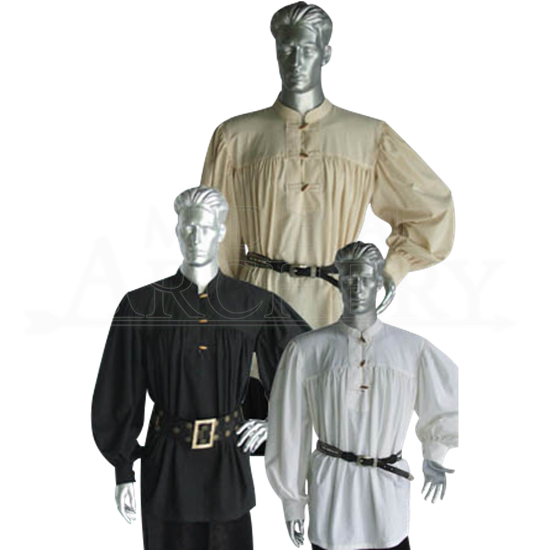 The Peasant Shirt is a simple but effective medieval-styled garment that can and should be used by all professions and classes. Peasants and workers will love it for its rugged simplicity and its comfort, where-as the upper-class nobility will enjoy it for the freedom and potential it offers.